When winter settles on New England, it can be tempting to cozy up on the couch until the snow melts, especially if you've got little ones. Getting the whole family bundled up can be an adventure in itself, never mind a long hike. To make getting out and enjoying the crisp winter air a little easier, we've rounded up a few of our favorite family-friendly adventures. These outings are generally shorter in distance with mild elevation while still being fun and exciting. So break out the mittens, dust off the snowshoes, and pack the hot chocolate, because winter will be over before you know it. Nestled at the base of Mount Washington, this New Hampshire adventure center is home to 28 miles of flat and gradually rolling terrain that are perfect for beginners and kids. Offering snowshoeing, skiing, fatbiking, and tubing, the whole family can find their fun. Once you've worked up an appetite, grab a bite at Glen View Cafe, where you can snag a table that looks out at the highest peak in the Northeast. A stream crossing en route to Mount Willard. Cait Bourgault. The climb up Mount Willard is just challenging enough to get the blood flowing, but it's easy enough that the little ones will be able to make it to the summit. Keep your eyes out for animal tracks in the snow as you hike up and enjoy sweeping views of neighboring White Mountains peaks at the summit. A designated sledding spot tucked between Vermont's foothills, this is any kid's snow-daydream. Enjoy the mountain scenery while kids of all ages slide down the hill over and over again. This spot is understandably popular, especially on weekends and during school vacations, so make sure to get there early. Looking for a more peaceful and affordable option than downhill ski resorts? This Nordic Center has miles of well-groomed trails for all levels of snowshoers and skiers. With affordable rentals and day passes, it's easy to treat the whole family to a day of fun. The center also offers childcare and kid-specific programs and lessons, so parents have the option to go out exploring on their own. Overlooking the Adirondacks from the summit of Mount Philo. Eric Adsit. 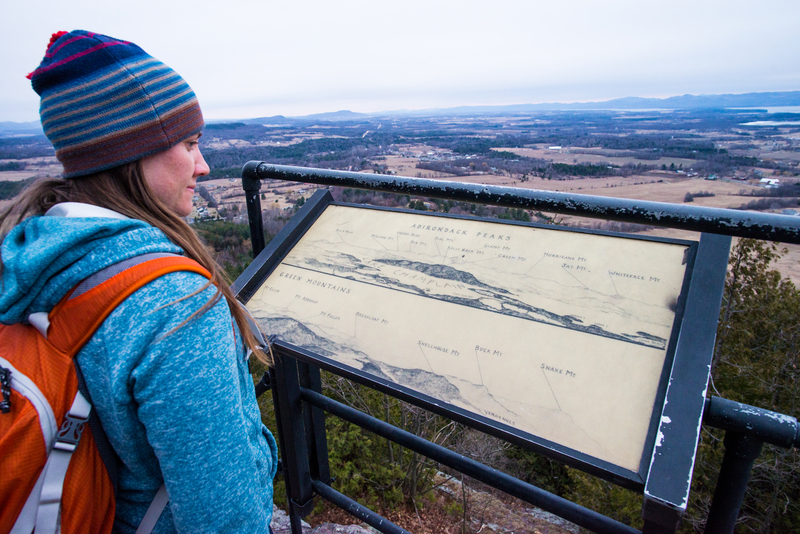 For a quick outdoor escape during your family's winter getaway in Burlington, Vermont, head 25 minutes out of town for a family-friendly hike. At 2 miles round trip with only 500 feet in elevation gain, this hike should be easy enough for the kiddos. From the top, enjoy views of nearby Lake Champlain and the surrounding mountains. If you're feeling extra adventurous, tow a sled to the top and ride the service road back down. Take the kids out for their first snowshoe of the season on this easy 1.2-mile loop around Meadow Lake in Southeastern New Hampshire. The flat, smooth terrain makes it a great practice route, and circling the lake means you won't have to worry about getting lost. Look for signs of winter wildlife as you meander along the shoreline and through snowy woods. This state park in New Hampshire's seacoast region becomes a winter playground when the snow falls, offering miles of trails for snowshoeing, skiing, hiking, and even snowmobiling. Make sure to stop by the New Hampshire Antique Snowmobile museum to learn about the unique winter sport and check out their collection of snowmobiles. 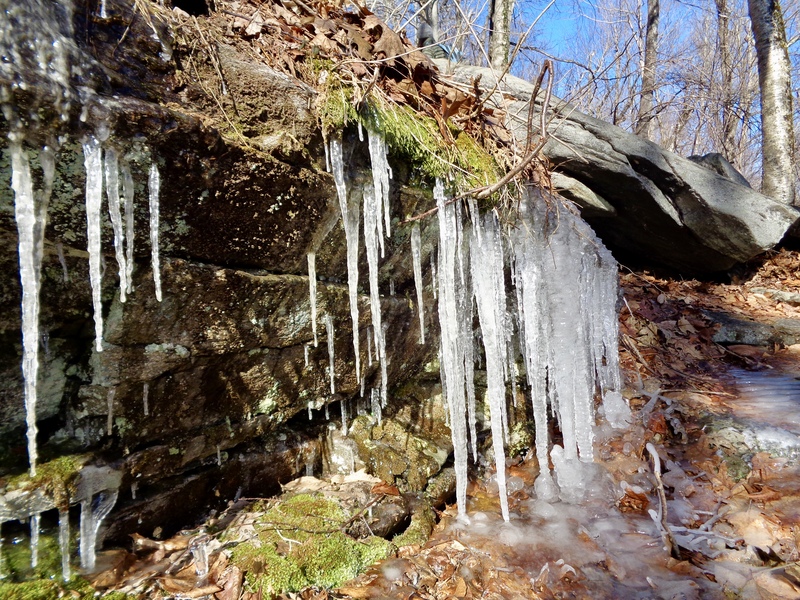 Icicles along the trail to Mount Washusett. Jenny Citrin. While this hike is probably too challenging for little ones, it might be the perfect adventure for teens who're looking for a fun hiking challenge. On the steep hike up the 4.3-mile loop, hikers will have plenty of time to enjoy the old-growth forest dusted in powdery snow. At the summit, soak in views of surrounding mountains and see if you can spot Boston off in the distance.